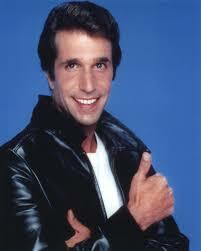 By the way, did you know that Arthur Fonzarelli changed my life? True story. I was at a get together for the Atlanta Jewish Federation way back in 1996 where he had his hundreds of admirers, and I had, well, perhaps one kinda distant friend who tagged along for a few minutes, and then found a table full of free fruit punch. The eyes of a legend eventually came to this skinny, gawkish Jersey kid who had been a numbers cruncher on some God forsaken street that was far from Wall Street. I have seen many distant friends who were interns and assistants back then become scions and successes. Even if they aren’t fully aware of their achievements, they have made this world a better place, I also vaguely recall this evening that I have only known many of you through mere words. I regret that. Life’s too short. So Happy Hannukah, and please, keep up your dream! Next time one of you wants to go have lunch at a nearby Waffle House here in Georgia, I’ll show you how to use Yiddish cuss words in an auction chant. NOTE: I wrote this on my Facebook page and given the feedback, I figured it was too good not to share here too. All the best.